Campbell Douglas & Morrison, dated 1893. 2-storey, basement and attic, 6-bay rectangular-plan, Scots Renaissance former Cowan Institute. Stugged, squared and snecked pink sandstone with roll-moulded polished dressings to principal elevation, chamfered droved dressings to remainder. Base course; dividing band course; projecting cills; moulded eaves course; crowstepped gables. NW (PRINCIPAL) ELEVATION: asymmetrical; zig-zag carved dividing band course between ground and 1st floors with carved thistles, roses and shamrock; ogee-arched doorway in 3rd bay from right, with 2-leaf panelled timber door and 3-light fanlight; windows to 2 bays to right; regular fenestration to 3 bays to right of 1st floor, broken pediment to 3rd window from right, carved strapwork panels to 2 windows flanking to right; 2 pedimented dormers to attic floor. 4-leaf panelled timber door to ground floor of penultimate bay to left surmounted by tooled Scottish heraldic panel, flanked by 2 small stained glass windows; windows between ground and 1st floors of flanking bays to left and right, tooled panel above that to right reading 'AD 1893', broken pediment above that to left; tripartite window above doorway with 3 strapwork pediments; balustraded balcony with crests of Scotland, England and Ireland underneath; bipartite window set in gablehead. Ogee-roofed, octagonal tower to centre of attic floor with louvred round-arched openings, projecting clock on ironwork brackets added 1901. SW ELEVATION: asymmetrical; 4-bay with 3-bay addition to right; regular fenestration to ground and 1st floors of 3 bays to left, irregular fenestration and doorway to basement; bipartite window to ground floor of centre bay, single window above; round-arched windows to ground floor of 3 bays to right, 2 windows to 1st floor of 3rd bay from right. SE ELEVATION: not seen, 1999. NE ELEVATION: asymmetrical; 5-bay with 3-bay addition to left; gabled bay with tall window with broken pediment to outer right, window set in gablehead; regular fenestration to 4 bays to left, irregular openings to remainder. Predominantly 6-pane timber sash and case windows. Grey slate roof. Cast-iron rainwater goods. Coped gablehead and ridge stacks with circular cans. Designed as the Cowan Institute for the Cowan family, who had originally intended to use F T Pilkington as the architect. The detailing is of high quality. 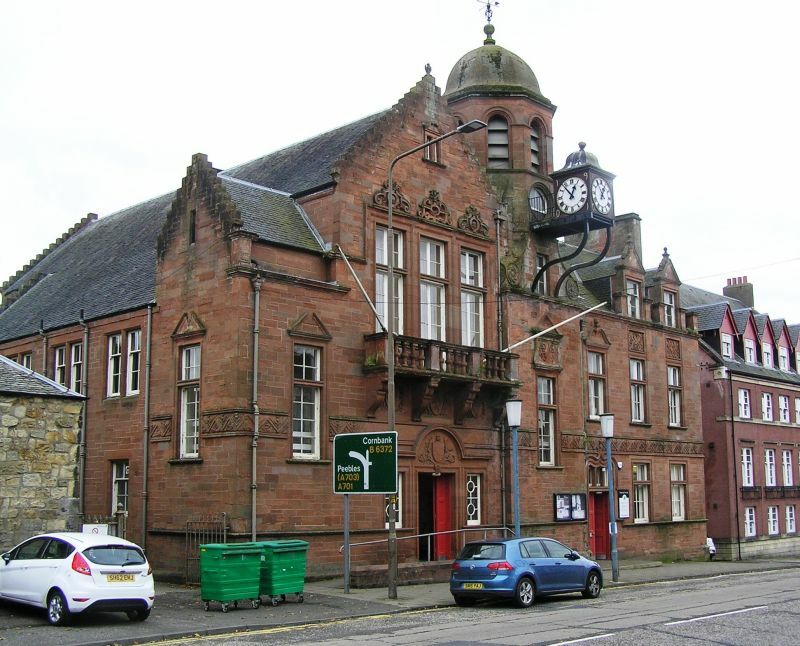 The 1901 clock is a copy of the Canongate Tollbooth clock, which was opposite the family's town house in Edinburgh.